25/10/13 – Mark Kirby confirms that Code Monkeys had nothing to do with the C64 version. Short creator speaks added. 15/10/13 – Added details about DroSoft release and potential of Code Monkeys being behind the C64 version. 24/09/13 – Patrick Furlong confirms that Amstrad version existed as he owned it. 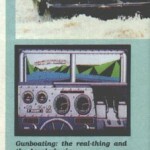 We’re not entirely sure if this actually got completed, but Accolade were still producing C64 games in 1990 (and even 1991), so its entirely feasible that Gunboat was being produced for the C64. 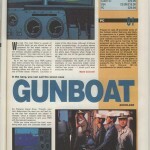 The game got fair reviews and even got a release on the ZX Spectrum and the Amstrad CPC. Interestingly, an advert for the game misses out the C64 in the list of platforms. Did the C64 hit any specific troubles compared to the others? 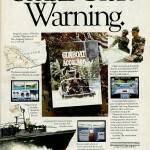 Another interesting point is that the Accolade version is missing in action, and only DroSoft released the game. Patrick Furlong suggests that he had an Accolade version on the Amstrad. So what happened to the C64 version? Was it just considered too poor in comparison to the 16-bit versions to be released and possibly after poor Spectrum/Amstrad conversions? Contributor Hank suggests that the Code Monkeys, who did the Spectrum version – also did C64 work too. However, Mark Kirkby confirmed that they did not do a C64 version, although it was considered. Was it therefore outsourced? More information needed on this title. Can you help? “I did write the Spectrum, CPC and PC engine versions for Accolade by converting the original PC code but there was never a version done for the C64. Definitely no C64 version done. Did the PC Engine/ Turbografx 16 version and Accolade suggested the C64 could be done as the PC engine had a 6502 core but it also ran at 7.62Mhz as opposed to just 1Mhz & they didn’t want it just wireframe only. We never got copies of the final Spectrum version so not sure if it ever got out there. Thanks for confirming Mark. Oddly it looks like it was certainly released in Spain, but the Accolade edition in the UK is at large. I believe that someone mentioned once they had the Amstrad edition by Accolade – so my guess is that it was released, just in limited numbers. I wonder if it’s worth pursuing any link between the 8-bit versions in more detail. According to this the Accolade Spectrum release is MIA – the ROM they have available there is the Spanish release from DroSoft. Is the CPC version the only 8-bit version released by Accolade themselves? I remember The Code Monkeys definitely did C64 work (E-Motion), so perhaps worth tracking down Mark Kirby? Good spot – I think it is. I’ve contacted Mark Kirkby to check if he had any involvement on it, so we’ll go from there. Cheers Hank! The CPC version was released by Accolade themselves.. I had a copy.